The Department of Languages is in block B of the building of the Faculty of Mechanical Engineering in Karlovo náměstí, Karlovo náměstí 13, Praha 2. 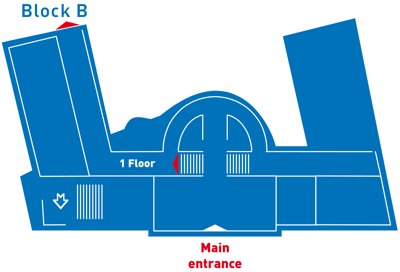 Enter by the main entry, go through the vestibule, turn left and go up stairs to 1st floor and go through the corridor on your left, which leads to block B. At the end of the corridor go up stairs to 3rd floor, where the Department of Languages is.